Discount Prices ! Discount Prices ! Discount Prices ! Discount Prices ! 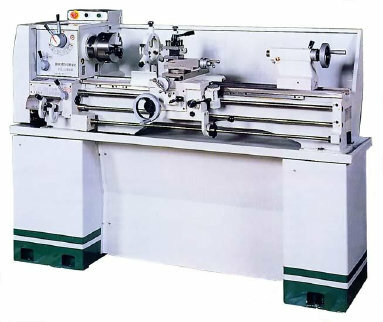 This New 13" Swing Birmingham YCL-1340GH Lathe is an all geared headstock 13" x 40" metal cutting lathe constructed of high tensile strength cast iron and hardened and ground bed ways. The main spindle is loaded with two high precision bearings and runs in a permanently filtered oil filled headstock making for long life of the bearings and gears. Also incorporated into the headstock on the Birmingham YCL-1340GH lathe is an 8 speed quick change lever action speed changer which provides spindle speeds from 70 to 2000 rpm. Inch and metric threading is standard on the Birmingham YCL-1340GH lathe . Swing over cross slide 8"
Swing over gap 18 3/4"
Spindle hole dia. 1 3/8"
Width of bed 7 3/8"
Dealer of Birmingham Lathes for More Than 30 Years !